These bars are amazing. I meant to save them for after dinner, but I couldn’t help myself. I meant to grab a photo before I dove into them, but the aroma lured me in. I meant to stop eating after nibbling at a corner, but now the pan looks like the Fantastic Mr. Fox got to them. They’re super easy to make, and they’re grain-free, too. Which makes them almost good for you, right? Good enough, that’s what I say. Dig in. Add salt, vanilla, and almond flour, and mix until thoroughly combined. Press mixture into a non-stick or parchment paper-lined 9×9 inch pan. 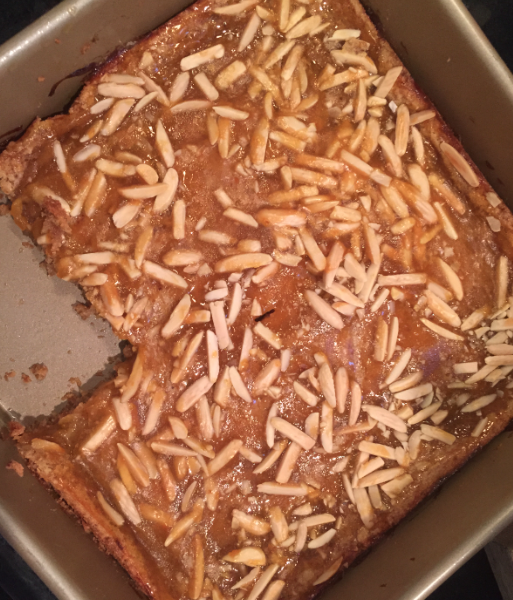 Spread preserves evenly on batter and top with almonds. Bake for 25 minutes, or until edges are nicely browned. Cool it if you can wait that long.